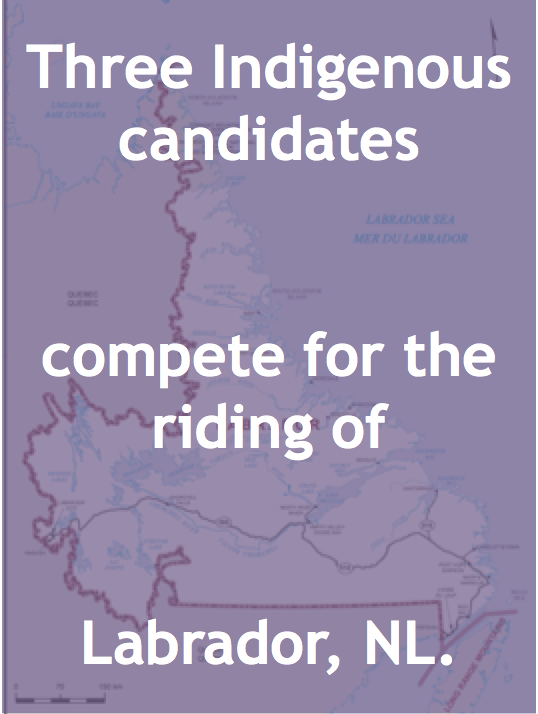 Three Indigenous candidates compete to represent the riding of Labrador, NL. 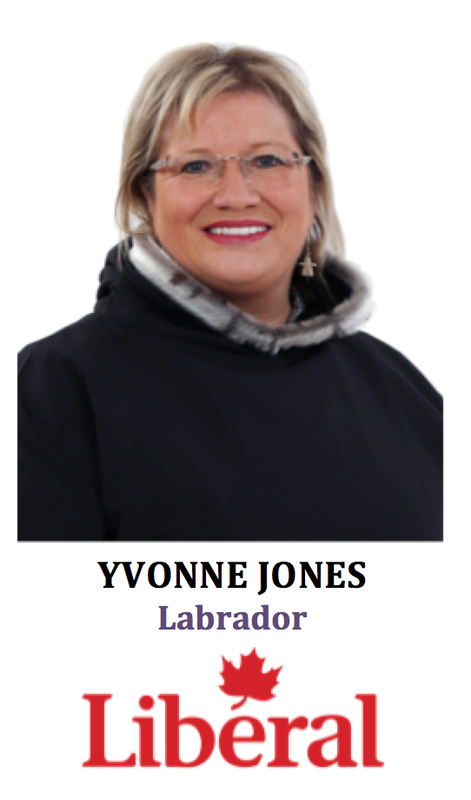 Yvonne Jones is Inuit-Metis (NunatuKavut) and is the Liberal Party’s candidates for the riding of Labrador, NL. 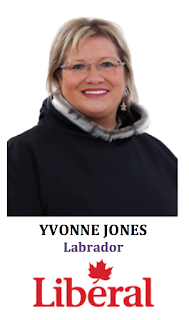 -Yvonne was elected to the House of Commons as a Liberal MP for Labrador in a by-election in May or 2013. She served as Vice-Chair of the Public Accounts Committee and was the Liberal Party Critic for Northern Development, Canadian Northern Economic Development Agency, ACOA and Search Rescue. -Prior to her entrance in federal politics, she was the Leader of the Liberal Party of Newfound and Labrador and MLA for Cartwright-L’anse au Clair since 1996. She previously served as Minister of Fisheries and Aquaculture and Minister of Status of Women. -Yvonne was also the former Mayor of Mary’s Harbour in Labrador. Her community experience includes volunteer work with Battle Harbour Development Corporation, the Combined Councils of Labrador, and the NunatuKavut. Peter Penashue is Innu and is the Conservative Party’s candidate for the riding of Labrador, NL. -Peter was elected to the House of Commons in the 2011 election with a slim win of 79 votes over the Liberal incumbent. He was the first Innu person to serve as a Cabinet Minister for Intergovernmental Affairs and the President of the Queen’s Privy Council for Canada. -He resigned in March 2013 due to allegations of irregularities in his campaign spending. He ran in the subsequent election in which he lost to Yvonne Jones. 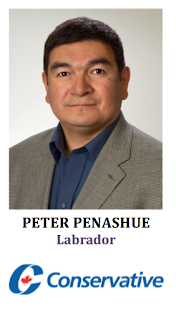 -Peter was Grand Chief of the Innu Nation from 1990 to 1997 and again 2007 to 2010. He was also Deputy Grand Chief from 2007 to 2010. -He was a Land Claims Director, Executive Director and Financial Administrator with the Naskapi Montagnais Innu. 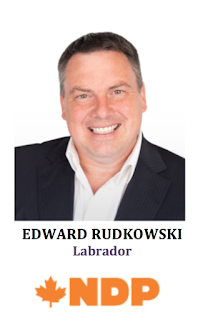 Edward Rudkowski is Inuit (Nunatsiavut) and is the NDP’s candidates for the riding of Labrador, NL. -Edward is a senior financial professional who has worked for TD, BNP Paribas and the Bank of America and has worked in New York, Toronto and Sydney. -He served on the Board of Directors for Them Days magazine, dedicated to documenting, promoting and preserving Labrador history and culture. He also volunteers at schools and as a sports coach. -He has an M.B.A. from Dalhousie University and a Bachelor of Business Administration from St. Francis Xavier University. - Including MPs Yvonne Jones, Peter Penashue, Labrador has elected two former Indigenous MPs both Liberal: Todd Russell and Lawrence O’Brien. 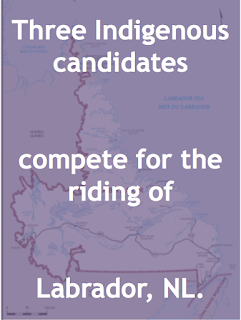 - For the most it’s electoral history, Labrador has been represented by Liberal MPs, the exception being Conservative Peter Penashue and Progressive Conservative Ambrose Peddle. 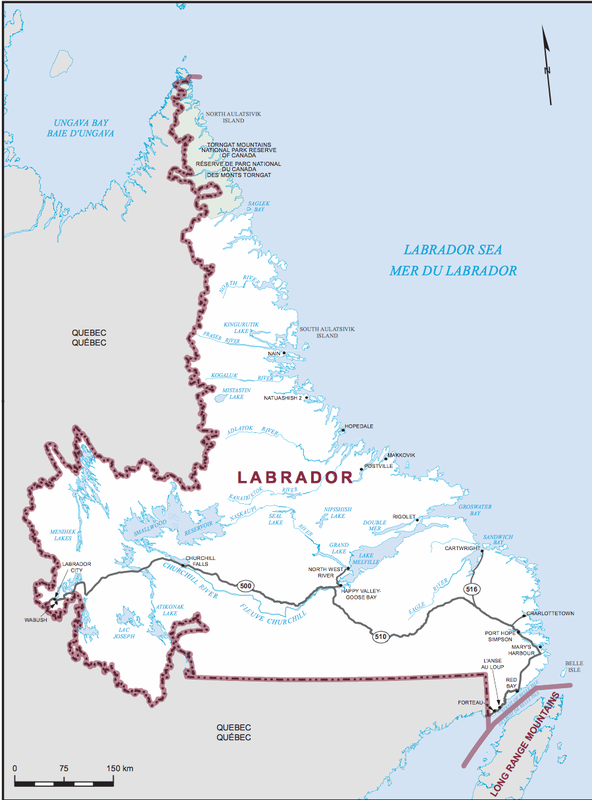 - The Aboriginal population in Labrador is 44% of total Canadian Citizen population in the riding (2011 Census NHS). 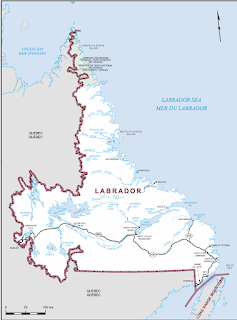 The Indigenous people include the Innu First Nations, Inuit and southern Labrador Inuit-Metis (NunatuKavut).